On leave last Friday and after I dropped off Little DinoEgg at the school, I headed off to the supermarket to do some groceries for this weekend's dinner. Note to self; Try not to be in the supermarket during the early hours (that is between 8.30am and 11am) unless I want to fight my ways around the fresh food section with all those early-risers aka aunites or full time mummies. Regardless, after 2 hours I emerged a happy person with hands full of food. And so today is the 1st time I cook the steamed sea bass. This is not the picture of my $7.95 steamed sea bass, I was too tired and forgot to take a photo of it till its all in our stomach. 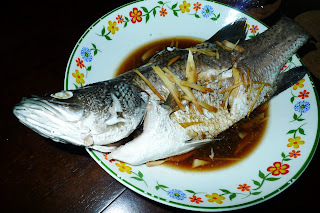 I wanted to do the Teochew styled but then I did not have all the necessary ingredients, thus its just plain steamed sea bass with steam fish sauce, sliced tomato, ginger n spring onions. Its kinda embarrassing coz I steamed the sea bass for slightly over 10mins, checked that its cooked with some poking around with a fork & happily served it. While trying to pick the meat at the back, we realized that its not fully cooked :( So back to the wok for another 5mins of steaming. The sea bass is juicy n sweet, I am very happy that we finished the fish during the dinner.